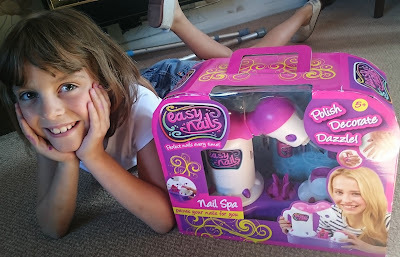 Grotbags was recently sent the new Easy Nails Nail Spa product from Character Online to review and was really excited to put it to the test. The Nail Spa is appropriate for children aged 5 years and over. 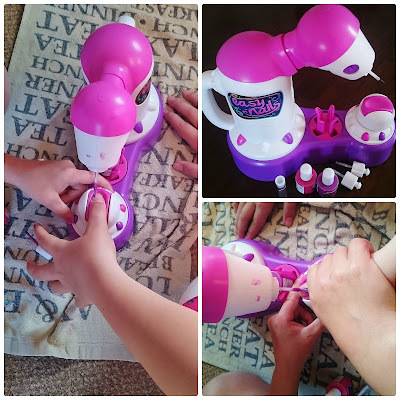 The machine is a bright pink and purple which will appeal to most little girls and has a carrying handle for moving it around. The nail paints that are provided, fit into the holder on the Nail Spa (which I do think is a great idea, no more spilt nail varnish). The Nail Spa is rather like a robot which you see painting cars in factories and is worked by pressing the pink and purple buttons on the side. The pink button dips the brush in the polish and the purple button then manoeuvres the brush on to the nail. Grotbags found this rather tricky at first but once she got the hang of it, had some great fun playing with a friend and has now requested a pamper party. Grotbags found that you had to keep your fingers really still when applying the polish so as not to avoid mistakes, but loved the novelty of the machine painting her nails. The brushes also wash easily in warm soapy water which is an added benefit. You can use this machine with normal nail polishes although we did not try this. Whilst this may not be the most accurate of machines it did provide lots of fun and I think little girls will love experimenting with their nails. The Easy Nails Nail Spa is priced at £29.99 and is available from Character Online. We were sent this product free of charge for the purpose of this review, but the opinion is my own. This looks like fantastic fun! Certainly something my girl would like.